October | 2016 | Home: Free Sociology! Including: do I really look like that? Do I really sound like that? Actually, this turned out to be more of a pleasure than I anticipated. Even the make-up part! The make-up artist put me at ease and went out of her way to help me get some tea before my appearance. All in all, a very friendly crowd there at Global. Click here for the full interview, or just click on the image above. Sandwiched between my teaching duties, my attempts to roll out the book, and my unhealthy obsession with the US election, I haven’t had much time to contribute commentary here on the blog about the many recent and ongoing developments concerning housing here in Vancouver, and across Canada more broadly. Lots of new moves from taxing vacant homes in the City of Vancouver to tightening CMHC mortgage lending rules all across the country. In your book, you make the case that single-family houses are bad for the environment, urban vitality and people’s health. Why is this? Let’s take these one at a time: With respect to the environment, the development of single-family houses directly consumes an enormous amount of land for suburban or ex-urban style sprawl, disrupting and displacing prior ecologies. By virtue of sprawl, houses also encourage people to drive everywhere, boosting greenhouse gas emissions. Moreover, houses generally require more energy to heat and cool than other types of dwelling, further leading to greater greenhouse gas emissions. Just about any way you look at it, single-family houses tend to be bad for the environment. Strikingly, detached houses also tend to deaden city life. Houses are generally surrounded by more houses, with lots of private space and very little public space. Mostly you don’t run in to anyone you don’t already know. Urban vitality thrives when the private and public are more balanced: when people have places to go and things to do near where they live and they can walk or bike or take transit to get there. All of these ways of getting around put people in contact with one another and make for an engaging environment where people can go simply to watch other people. Of course walking and biking are good ways to get around not just because they provide for more urban vitality. These kinds of activities are good for us because they keep us healthier. Denser, more vital, and more walkable environments encourage healthier habits. Single-family houses don’t tend to get us out and about as often. A lot of people are still emotionally invested in the idea of owning a single-family house. They grew up in one and can’t imagine not also raising their families the same way. What do you say to them? The first thing I say to them is that they are not alone. Culturally, many people have come to think of the house as an important symbol of success. Many others see acquiring a house as an important aspect of taking proper care of their children. No one wants to be viewed as a failure or a bad parent. But the second thing I say to people who can’t imagine doing without a house is that they might try letting their imaginations run a little more wild. Vancouver actually provides a wonderful environment for re-thinking what’s important, both in terms of broader cultural understandings of success, and in terms of everyday aspects of livability. Most of the people who live here, including parents with children, have made a home without a house. What’s more there is real strength in diversity. In that sense I won’t suggest a single optimal alternative to the single-family house. We have people who really enjoy high-rise living and others who thrive better in low-rise neighbourhoods. We have people who love the yard access and porch feel of some of our newer townhouses, and others who prefer the character of life in our older, subdivided mansions. There are lots of lovely ways to make a home, which is one reason we shouldn’t reserve nearly all of our urban land for only one way, like we do now. Density is often perceived as a bad word in Vancouver. What is your response to anyone who is opposed to densification? My first response is to bring history back into the picture. Densification used to be a normal part of urban growth, particular when land markets were left to their own devices. The prospect of having little control over one’s neighbours frightened residents of the city – especially the elites and those in the rising middle class. A factory or saloon could move in next door. The owner of a wealthy mansion nearby could subdivide their property and turn it into a hotel. These things happened a lot in old Vancouver. Single-family residential zoning was, in large part, an effort to preserve some space for residential life outside of the workings of the urban land market. So what I like to call a Great House Reserve was put in place all around the city. So how did that turn out? Through subsequent regulation, city life became cleaner, quieter, and much more livable. Vancouver figured out how to do urban livability especially well, and more people here live outside of the single-family areas than in them. But taming the land market within the city led to its revenge in the suburbs. Single-family houses have moved well beyond the means of ordinary Vancouverites. For those opposed to densification, I’d agree that we don’t need high-rises everywhere. We want to keep Vancouver both livable and diverse in urban form. But we still have way too many houses to encourage that diversity. Even though Vancouver is a leader in this regard, we’ve still set aside some 80 per cent of our residential land base to support single-family houses. That’s huge! At this point, we’ve got the power of the city, through these old zoning by-laws, keeping anyone but multi-millionaires from settling down in these places. I don’t think the city should be doing that. Some people view condos as lonely places, and social isolation has come up often as a complaint among people living in Vancouver. What is your response to this? Could more condos make for a lonelier city? There are lots of things we can encourage besides condos. Indeed, the City of Vancouver is encouraging more purpose-built rental buildings. In the past, we’ve also had a variety of programs that helped people form housing cooperatives. Cooperatives require people to work together to manage their buildings, directly countering social isolation. At the same time, they help preserve affordable living options in the city. We should be doing more of this to insure the choice isn’t simply between high-priced houses and luxury condos. That said, there’s also no reason for us to believe that condos necessarily lead to a lonelier city. In fact, one of my livelier interviews involved a Vancouverite describing how close she’d become to her neighbours in her Yaletown condo building. She noted that everyone in her hallway left their doors open, and the kids ran back and forth between units, enjoying the communal nature of the space. Running counter to perceptions, many people described these kinds of communities developing in their buildings. More broadly, people also noted how they enjoyed running into the same people over and over at parks and playgrounds and local coffee shops. Generally speaking, mixed use urban density is a far better cure for social isolation than the largely privatized spaces of neighbourhoods dominated by single-family houses. Do you think urban planners have made any mistakes in Vancouver’s development that have made the city less livable? That’s an interesting question. There were some mistakes planners made everywhere across North America, and I would argue one of the biggest was creating the Great House Reserve and setting so much land aside for single-family houses. Beyond that, there were other mistakes planners really wanted to make in Vancouver, like bringing a freeway into the heart of downtown in the 1960s, that they were largely prevented from making. Since then the record of Vancouver’s planners has generally been far better, and I think they deserve a large share of the credit for the livability of the city. Vancouver has transitioned the furthest and fastest away from single-family houses of any major metropolis in North America while becoming a model for livability around the world. That’s a real achievement! But there are still issues that remain. The biggest of these is insuring livability for all residents, rather than just the most wealthy. Further enabling densification of single-family residential areas will go a long way toward opening up new market options for middle class Vancouverites. But we need a lot more non-market housing too. What lessons can other cities learn from Vancouver on building a livable city? I think Vancouver potentially has a lot of lessons to offer other cities. I like to think of these as building lessons. How do we move forward from the legacy of the Great House Reserves set up around cities all across North America? Vancouver figured out ways to build around this reserve, both in the old urban core of the city, and out in the hinterland. Buildings in the urban core provided the attractive living alternatives that characterize so much of Vancouver today. The big construction projects in the hinterland were the Agricultural Land Reserve and our many parks, which together protected much of the region’s land from further encroachment by suburban sprawl. Slowly but surely, Vancouver is also building over the old Great House Reserve, reincorporating this land back into the urban mix. Finally, Vancouver has renovated the very meaning of single-family residential neighbourhoods insofar as they’ve legalized secondary suites and laneway houses, transforming lots that initially could only support a single household into lots that can now support three. All of these building projects are things other metropolitan areas can also work toward. Now on TV: My book! My talking head is on TV! Today’s stormy weather and general traffic chaos kept my taxi to a downtown studio from arriving on time for a scheduled interview about my book with the Business News Network. Nothing like a shot of adrenaline and frustration with a harried taxi-dispatcher (and really, what could she do?) to start my day. On the bright side, we were able to work something out via Skype – not perfect, but it worked for most of the interview. Here’s the link to the video segment. I appreciated them having me on, though it wasn’t clear at the outset where they were planning on taking their questions for me. In other news appearances, I was on CBC’s The Early Edition on last week, on Monday morning (Oct. 3rd), talking about the accessibility of ownership and its meaning for Canadians (based upon the recent Angus Reid Survey). Here’s the audio! (I’m on at the 01:41:20 mark with Kevin Falcon). Again I had taxi issues! But I ultimately made it down to the studio for the chat, and received a much-prized CBC mug for my efforts. Later on, Wanyee Li and I spoke again about the potential for densifying Vancouver‘s single-family residential neighbourhoods as a way of improving housing accessibility, touching on the new advocacy group Abundant Housing Vancouver that’s seeking to make that goal a reality. She very kindly inserted another plug to the book there. So my career as a media juggernaut is rolling along! I’m partially using this blog post just to bookmark all of these appearances, but it’s also a heads-up, of sorts. You can expect to see even more of my mug (or at least my name) as the month progresses. 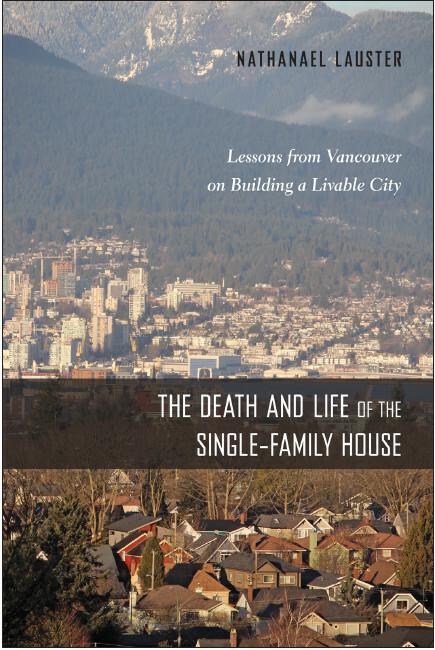 My book, The Death and Life of the Single-Family House, rolls out next week – I’m expecting my hard copy in the mail any day now! – and I’ll be a keynote speaker at Vancouver’s Re:Address Summit on housing affordability on October 27th. Sure to be a Halloween treat!